Sometimes there's not enough excitement in your life. Well now this page has come along with a list of places that guarantee adrenallin fulled fun - whether that's wild 4x4 experiences, the UK's number 1 tree top adventure or even skydiving. You'll find something that'll get your engine going here! Welcome to, activity and adventure in the West Yorkshire area. Activities include, mountain boarding, skiing and snowboarding in the winter months (weather permitting), archery and crossbows, rifle and pistol shooting, target slingshot and slingshot paintball, zorbing, bumper balls, survival and bushcraft courses, den building and bushcraft for the younger ones, go-kart building / racing and team building activities. provides adventure activities for most ages and abilities from introductory to more advanced sessions. Caving, Climbing and Abseiling, Guided walks including the Three Peaks Challenge, and also Navigation Skills from basic map & compass, GPS to National Navigation Award Scheme Gold Award accredited courses. - Climb into the forest canopy and experience over 25 exciting tree top elements at Aerial Extreme near Bedale. Can you complete the challenge of navigating your way around this awesome adventure rope course? Set in 12 acres of beautiful grounds, a unique blend of parkland, woods and lakes, and open to visits from anyone, no matter what your age or ability. Activities on offer include high ropes course, zip wire and gorge walking. , North Yorkshire - provide 4x4 Experience Days: giving you the opportunity to tour North Yorkshire both on and off road in our new Land Rover Defender 110 with an experience guide/instructor alongside you. You don't share with any other customers, but you may bring up to 3 guests to sit in the back or share some of the driving. run one day, weekend and extended outdoor courses, events and holidays throughout the National Parks of Yorkshire. For excitement, fun and educational experiences in the great outdoors, let their professional team guide you through some of the most magical and unique places that our landscape has to offer. Take to the trees and speed down zip slides. They're part of an exciting course of rope bridges, Tarzan swings and crossings; all set up to 120 feet above the forest floor. Also, Go Ape Forest Segway bring down from the trees and onto solid ground, from two legs to two wheels - it's a totally unique way to tackle the trails and explore Yorkshire's finest woodlands. Log Heights Why not make this the year when you test your mettle on the Log Heights ropes course in the beautiful surroundings of Ripley Castle, near Harrogate? You could be walking along a treetop beam one moment and jumping high in the sky to catch a trapeze or negotiating a massive rope ladder the next. 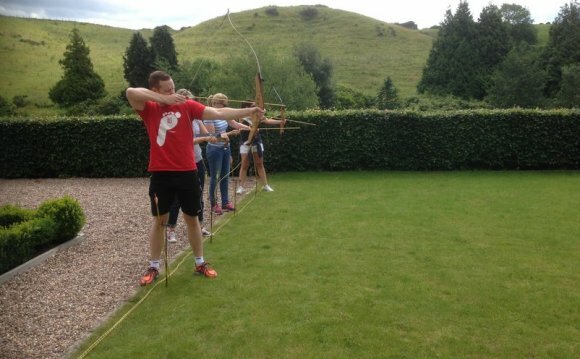 outdoor activities range from high energy assault courses, ‘leap of faith' and zip wire to skills from archery & bush craft to Iron Age round houses and pottery. The full range of activities include: archery, assault course, bush craft survival, giant swing/ push ball, high ropes/low ropes, Iron Age roundhouses, ‘leap of faith', mountain or BMX biking, orienteering, pottery and zip wire. All activities are run by fully qualified and experienced members of staff, so you're sure to be in safe hands. Flexible catering options are available, from barbeques and buffets to three course meals freshly prepared by the in-house chef to your dietary requirements. , nr Thirsk, North Yorkshire. Venture into Yorkshire's most exhilarating 4x4 off-road driving course for a spectacular experience. Nothing matches the white-knuckle, adrenaline-fuelled challenges of handling a four-wheel drive vehicle over the rugged terrain of the stunning North Yorkshire countryside. Unlike other centres, you pay for a 4x4 and a dedicated instructor - not just a seat in a vehicle. So, if you are a skilled off-road driver looking to move up to the next level, or a beginner who wants to take on a new challenge, the course choice of solo packages and the high quality vehicles guarantee that you will find the experience you're after. , York aim to provide you with the freedom and guidance needed to determine exactly what you would like from your day and to create an individual experience for all their clients! All their rock climbing days are run as private guided sessions for you and your group, you will not be with anybody else leaving you free to choose whatever you'd like to do with your guide (within reason!). want to provide a variety of activities and things to do in Yorkshire that would suit everyone's needs, from Mountain Biking to Body Zorbing! Along with these activities they also want to provide the best instructors who can teach you more than just the basics and really make your experience one which you will remember. , Leeds, West Yorkshire covers 25, 000 square foot and boasts professional and bespoke ramps.The skatepark is used for BMXing, Skateboarding, Rollerblading and Scooter Riding. They have complete beginners to pro riders using the park on a daily bases.They work closely with schools, youth groups and extended services where they aim to help get children back into exercise whilst having fun through learning or improving with different non-traditional sports. The skatepark often plays host to events, demos and film premiers starring the biggest names in BMX, skateboarding, inline skating and scooter riding. - Learn to wakeboard or water-ski at the North of England`s premier full-size cable and wake park. Wakeboarding is one of the fastest growing water sports in the world, try out this fun, adrenaline fuelled sport with us - all equipment provided. - Segway Events is the largest provider of Segway corporate experiences in the UK. Segway Events can provide a variety of bespoke packages for a wide variety of clients from small group sessions to full day events. Targeting everyone with a taste for adventure, riding a Segway is an activity that the vast majority of people are capable of undertaking. The event crew will provide all the necessary equipment and rider training to make sure all experiences are safe and positive. specialise in introducing people to the exciting sport of skydiving whether it's jumping for charity, a one-off experience or something you want to take up as a hobby or sport. offers: Shooting, Archery, Mobile Climbing Wall, Canoeing and kayaking. Offering Instruction from taster sessions and trainingTraining through to single and Multiday trips. Also offering personal development, Team building and British Canoe Union training courses. , York - Set in beautiful countryside on the outskirts of York, York Golf Range provides outstanding facilities and exceptional value for money. Hit balls on the golf range, Putt to victory on the Crazy Golf, Play golf on the 9 hole course or kick a hole-in-one on the FootGolf, whatever you choose you'll have great fun at York Golf Range. North Pennines, Countryfile & North of England Trike Tours.